In recent years the phenomena that was “family game night” has fallen by the wayside. Tablets, movies, phones and computers have replaced a lot of the time people used to spend together. While video games can be played in groups and do have their positive effects, for this article we are going to look at board games. Research has shown that in a child’s formative years, board games can have an incredibly positive effect on their happiness, demeanor, mental capacity, mathematic ability and they can be used by parents as a way to teach important lessons like teamwork, honesty, sportsmanship, strategy and how to accept both victory and loss. Additionally, board games have been used for years now by therapists to help their patients think critically, communicate effectively and increase their hand eye coordination. Not to mention that time spent with family is generally very important, and that board games are just plain old fun. In this article we will look at a few board games that can be played by children and adults alike and which can have a positive effect on personal development. Kingdom Builder is a deceptively simple, analytic strategy game. The board is built from 4 large tiles that are put together at random. Each is composed of dozens of hexagons that represent a different biome (desert, forest, grassland, etc). Every player is given a number of small wooden buildings that represent settlements. At the start of each round every player is dealt a single card from the deck, this card tells the player which biome they are allowed to play three of their settlements on. They must play within that biome, and the cities must be adjacent to one another. If the biome they draw is adjacent to another where they have previously played a settlement, they must play in that particular biome. If not they are free to choose from any on the map. Randomly dispersed through the map are tokens that assist the player with power ups. The player with the most points after having played all their tokens wins, and the way you gain points is based off three cards randomly drawn at the start of the game. So the win conditions are different with every play-through (largest continuous city, most grassland cities, most cities near mountains etc). As such each player must constantly adjust their strategy while working with what card they draw every turn. Figuring out how to block other players while winning themselves. 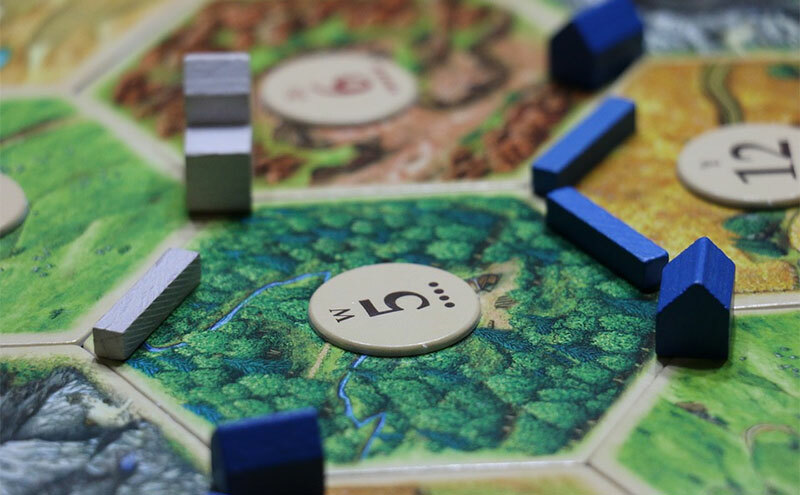 As of 2015 over 22 million copies of Catan have been sold in over 25 languages. During the time it will take you to read this article, hundreds of people will have started a game of their own. The goal of Catan is unsurprisingly, to score more points than the opposing players. You do so by building cities, settlements and roads on a board composed of hexagons. Every turn two die are rolled to determine which of these hexagonal spaces spawn their corresponding resource (brick, lumber, wool, grain, and ore). If you have a building adjacent to a space which has spawned a resource, you get to collect it. Necessitating that you place your buildings carefully depending on which resources your strategy will require. With some only being useful later in the game. Regardless though, no one player will collect enough from their cities alone to build a game winning amount of settlements. As such, you will have to barter with other players adding a layer of diplomacy to the strategy. Carcassonne is a turn based, tile laying, European style board game that plays like a strategic puzzle. Players take turns placing down tiles to complete a landscape that includes cities, roads, farms and cloisters. The rules that determine which tile can be played where are incredibly simple. And as you go you are allowed to place down markers to score points for completed landscape features. Some score almost instantly, while others will take up one of your limited markers, but score more points when/if you get them back later in the game. Players can help each other by adding their tiles to projects that another person is trying to complete, or hinder one another by purposely blocking them. The tiles are drawn at random, so each player must work with what they are given, constantly adjusting their strategy. This game may seem incredibly simple at first, but Dixit is so much more than that. Each player takes turns being the “Storyteller” where you choose one of your cards and describe it using a phrase, word, motion or sound. Anything short of actually saying what it is. The other players then choose a card from their hand that they think best matches yours. The cards are shuffled and everyone has to choose which they think is the storytellers. With points being awarded for those who guess correctly. But if the storyteller is too vague and no one chooses their card, they are not given points. This game makes you develop communicative abilities as well an emotional quotient, learn how to read other people and do all of this while using both sides of your brain. Not only do you have to describe something abstract, in an abstract manner. But you need to tailor your description in such a way that the other people at the table will be able to understand it. For a game that just revolves around cards, there is a lot to be learned from Dixit.